^ "Abe shows staying power as Japan's third-longest-serving leader". Nikkei Asian Review. May 27, 2017. ^ "Gov't distances itself from NHK head's 'comfort women' comment". Japan Today. January 27, 2014. Retrieved 22 July 2018. ^ "Abe calls for strategic ties between Japan, India". Nerve.in. 2007-08-22. Retrieved 2017-04-06. ^ Martin Fackler (2012-12-26). "Ex-Premier Is Chosen to Govern Japan Again". New York Times. Retrieved 2017-04-06. ^ Ince, Martin (2014-05-19). "Prime Minister Abe to Accelerate Internationalisation of Japanese Universities". QS Intelligence Unit. Retrieved 2017-04-06. ^ Taylor, Veronica (2014-12-30). "Japanese universities reach for global status". East Asia Forum. Retrieved 2017-04-06. ^ "Press Conference by Prime Minister Abe". Kantei. 2014-11-21. Retrieved 2017-04-06. ^ "Abe stands his ground as Moritomo Gakuen scandal drags on". The Japan Times. 2017-03-13. Archived from the original on 2017-03-17. Retrieved 2017-03-27. ^ "North Korea shoots missile 500km in 'show of force' to Trump, says South". The Guardian. February 12, 2017. Retrieved 20 May 2017. 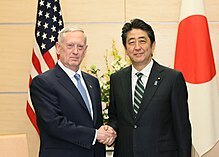 ^ "Trump commits to security of Japan". USA Today. February 10, 2017. Retrieved May 20, 2017. 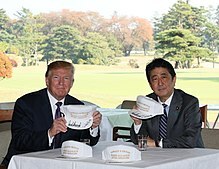 ^ "Trump and Japan's Abe take a swing at golf diplomacy". Reuters. February 11, 2017. Retrieved May 20, 2017. ^ "Japan's Abe hopes for reform of pacifist charter by 2020". Reuters. May 3, 2017. Retrieved 20 May 2017. ^ Repeta, Lawrence (2017-10-15). "Backstory to Abe's Snap Election – the Secrets of Moritomo, Kake and the "Missing" Japan SDF Activity Logs". The Asia-Pacific Journal: Japan Focus. Retrieved 2017-10-17. ^ Asahi Shimbun staff (2018-07-11). "LDP under fire for partying as disaster loomed in western Japan". Asahi Shimbun. Retrieved 2018-07-12. ^ "Word of Trump-Kim Summit Meeting Stirs Concern in Asia". The New York Times. March 8, 2018. Retrieved June 11, 2018. ^ "Trump-Kim summit: Why Japan's defence strategy hangs in the balance". The Straits Times. June 11, 2018. Retrieved June 11, 2018. 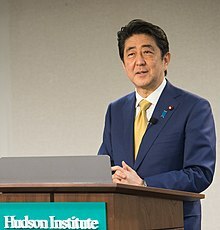 ^ "Abe repeats desire to hold summit with North Korea on abduction issue". Japan Times. June 11, 2018. Retrieved June 11, 2018. 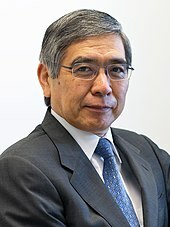 ^ "安倍晋三抵北京 日本首相时隔7年正式访华". 观察者网. October 25, 2018. Retrieved April 13, 2019. 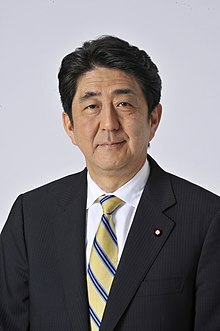 ^ "Japan's prime minister is more of a survivor than a reformer". The Economist. Retrieved 2018-09-26. ^ "No comfort". The New York Times. March 6, 2007. Retrieved March 8, 2007. ^ Kingston, Jeff (2015-08-22). "Abe's revisionism and Japan's divided war memories". The Japan Times. Retrieved 2017-04-06. ^ "Washington's dubious silence on Abe revisionism". Chinadaily.com.cn. 2015-08-14. Retrieved 2017-04-06. ^ "Abe refuses to make direct apology". Koreatimes.co.kr. 2015-08-14. Retrieved 2017-04-06. ^ Kosuke Takahashi (2014-02-13). "Shinzo Abe's Nationalist Strategy". The Diplomat. Retrieved 2017-04-06. ^ "Blame George Kennan for Abe's Bad History". Bloomberg.com. 2015-04-29. Retrieved 2017-04-06.